Rechtrichten: Is dat iets voor jou? Kind- en Jeugdcoaching- vaardigheden leren! 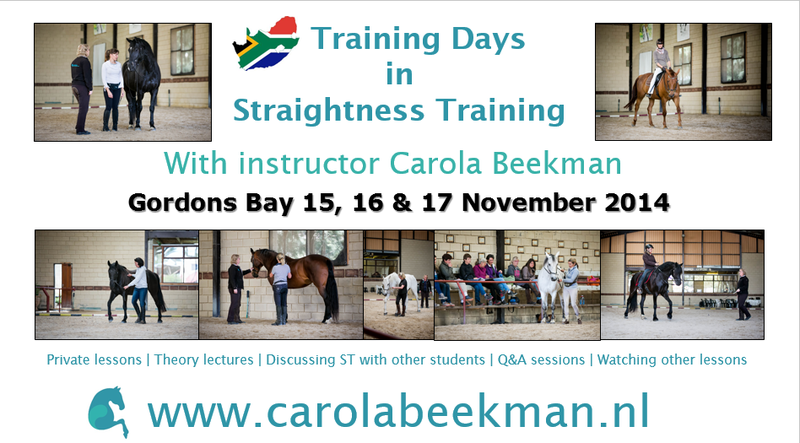 From the 15th till the 17th of November 2014 I went to Gordons Bay in South Africa to teach Straightness Training. The event was organized by Anina Meiring and hosted by Sandy Biggs at her amazing venue Xenophon Equus Centre. Saturday we started with a ST members day, students from de ST Mastery, the Home Study Course and members of ST Monthly. Five of the riders were returning students and I was amazed by their progress since May 2014. So we could really start studying on new and more advanced subjects. We could prepare for touchstones in Straightness Training Evaluation. We worked a lot on better relaxation of the lower neck muscles and reducing the push in the haunces in. It was interesting to see we solved physical, emotional and mental issues in the process! The seat was practiced in all exercises in walk. Especially in haunches in, half pass and the pirouette the correct seat is a challence! To mix it up with some fun, we used the fencing game to get the whole body in position (the phisical seat) and the statical seat correct. The fencing game is both fun and effective! Two of the horses and riders were new students but had already started in ST or were advanced in the academic art of riding. During the first lesson we checked all the basics and added on some details to improve these first exercises. On Sunday and Monday we could easily move to the more advanced exercises, because she was so well established in the basics. With the second horse we focussed on rehabilitation after his injury. On Sunday we were joined by the members of the public, a wide variety of amazing people interested in our way of training. Amongst them was a dressage judge, a veterinairian and a lady who works with horses to help special needs children. We started the day with a theory lecture about Natural Assymmetry and the “why” of Straightness Training, the exercises and their goals. Next were the individual lessons and Q&A session just before we had a lovely lunch. Xenophon Equus Centre has a brand new café and tack boutique, a stunning place with great food! After lunch we continued with a theory lecture about the sequence in our aids, aiming for “invisible communication”, with energy and bodylanguage. Next was everybody’s second individual lesson. With Eagle’s Coalminer we also did a Natural Assymetry assessment to get an idea of his talents, challenges and tendencies. Our very skilled photografer Tracy Robertson made pictures, so we can always see them in the future. We concluded the day with a short Q&A session. A huge complement to all the people in the stand. You came with a open and positive mind, creating a relaxed learning environment. You were concentrated, taking notes and asked lots of questions during the theory sessions and after the lessons. I’ve been on the stand many times and I know it’s hard work, so well done everybody! On Monday morning all riders had their last lesson and we witnessed a very special moment in a rehabilitation session with the horse that is recovering from an injury. After a bit of very concentrated work in standstill and walk, he just fell a sleep during a little break! The horse pushed his cheekbone in, so we were helping the horse to relax in the correct stelling and his whole body started to make little pooping noises. So when he fell asleep we had to make it a big break and ended the session! The effect of Straightness Training still amazes me! It proves again that you don’t HAVE to trot and canter to make a horse feel tired. In the afternoon we did some theory sessions, discussing a sorts of straightness training topics, we watched videos of the students and of me and Macho, dicussing what we saw and how to improve. What an amazing three days we spend together. for opening up to all the new knowledge and sharing your lessons with all the theory particpants. Thank you Anina Meiring for the fabulous job in organizing this event and helping others on their ST journey, great job! Thank you Sandy Biggs, family and staff for welcoming us to Xenophon Equus Centre and taking care of us and serving us a lovely lunch. Tracy Robertson, thanks for making the most stunning pictures! Looking forward to see everybody again during the next clinic in May 2015. Can’t wait to see the progress in all of you! Thank you for your interest in this report. 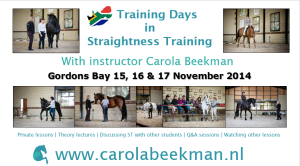 Would you like a Straightness Training clinic near you? Read all about it here. You can also choose to be coached by me remotely. 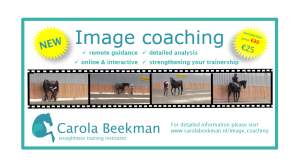 With Equestrian Image Coaching designed by me, I can help YOU learn, with guidance from a distance. Introduction price valid untill 31 December 2015. 20 & 21 februari 2016 Clinic Rechtrichten- Arnhem | Carola Beekman op Wat is Rechtrichten?